On Thursday, April 4, at 7 pm, The Southborough Historical Society brings the third and final living history event to the Archives and Museum. 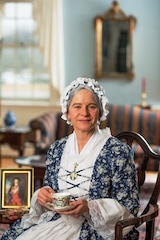 Anne Barrett will present Martha Washington, her early life, triumphs and tragedies, determined spirit and undying devotion to the father of our country. Please join us as we spend an hour with the Mother of Our Nation!